Born in Grover, NC, on July 13, 1895, Rush Dickson was the only son of Josephine Bird Dickson, the second wife of Joseph Robert Dickson. There were four brothers and sisters from Joseph Dickson's first wife. Junior Achievement When he reach maturity, his father offered him a farm or a two-year college education. Rush decided on the education, but refused the offer to pay for it. Instead, he borrowed $600 in a loan and entered King's Business College in Charlotte. Before graduating from King's, Rush began working in 1912 as a book-keeper for the Gem Yarn Mills in Cornelius, NC. He finished his work at King's through mail studies and Saturday exams. After a year, he went to work for Clover Cotton Manufacturing Company, Clover, SC. During this period, he completed repaying his initial loan and setting aside some savings. After three-and-a-half-years at the Clover mill (1913-1917), he accepted a job with the Erwin Cotton Mills in Durham, NC. After six weeks in Durham, the company transferred him to their Locke Cotton Mill in Concord. Rush accumulated stock in both the Clover Cotton and Erwin Cotton firms. When America entered World War I, Rush had been rejected by his draft board for service, but he persevered and joined the Army (1917-1918). He was recruited by Cherokee Falls Manufacturing Company near Gaffney, SC, after his service. While there, a stockholder in the Clover Cotton Manufacturing Co. approached Rush to swap his Clover stock for 147 shares of the Cherokee Falls firm. They made the trade. Within six months, Cherokee Falls was purchased for $720 a share. Finding himself with a sizeable investment profit, Rush decided to form R. S. Dickson & Company on Oct. 1, 1919, in Gastonia. A partnership, R. S. Dickson & Company dealt with textile manufacturing stock trading and initial offerings. In 1924, the firm was incorporated. In the booming 1920s, Rush opened new offices in Goldsboro, NC; then Greenville, SC, and then a Wall Street office in New York City (1925). On April 1, 1929, R. S. Dickson & Company moved its headquarters from Gastonia to Charlotte, NC. 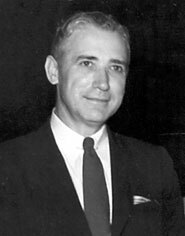 The prior year, Dickson had heeded warning signs and had liquidated his company and personal stock investments  thus avoiding the stock market crash. From 1928 through 1931, the firm operated strictly on a brokerage basis, selling and buying stocks on commission in order to conserve capital. In 1932, the firm began buying defaulted municipal bonds. In September 1933, the Goldsboro office was moved to Raleigh, NC. New offices were opened in Chicago (1936), Richmond (1937) and then Atlanta, GA, and Columbia, SC. The firm was an underwriter, dealer and distributor of municipal and corporate securities. The R. S. Dickson & Company purchased American Yarn & Processing Company of Gastonia in September 1942, and followed up with a purchase of Efird Manufacturing Company of Albemarle, NC, in 1947. After running these firms as separate entities, the American & Efird Mills, Inc. was created in 1952 merging textile operations. 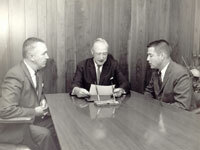 During the 1950s and 1960s, R. S. Dickson & Company also made loans and investments to companies than later would become part of the company, such as Harris-Teeter Super Markets and Jordan Graphics. Rush Dickson was active in industry groups (Investment Bankers Association and the North Carolina Textile Foundation), businesses (Pyramid Life Ins. Co., Charleston, SC; Palmetto State Life Ins. Co., Columbia, SC) and community organizations (such as the Charlotte Memorial Hospital board, 22 years; North Carolina Citizens Association, etc.). He created the Dickson Foundation Inc. and the Rush S. Dickson Family Foundation, contributing to charitable, religious and scientific organizations. Rush Dickson retired from R. S. Dickson & Company in 196#. He married Lake Simpson and they had four children  Rush, Alan, Barbara and Jane.